It’s no secret that AIR MILES is my favourite rewards program. My grandmother introduced me to the program in the mid 90’s and I’ve been reaping the rewards since then. Last year I switched to 100% AIR MILES Cash balance and have been redeeming my AIR MILES reward miles at our local Sobeys to save money on our grocery bill. I was excited to learn that there is a new way to redeem your AIR MILES Cash balance: eVouchers! If you’re like me and love to maximize savings (and save time too! ), then listen up. You’ll want to take full advantage of this new way to instantly redeem your AIR MILES reward miles online. An eVoucher is an electronic voucher that you use to redeem reward miles in your AIR MILES Cash balance instantly online. It reminds me of a gift card that you bring to a store to save money on your purchase. If you’ve got at least 95 miles in your AIR MILES Cash balance, you can get an eVoucher right now. I’ve already redeemed my reward miles for multiple eVouchers and it’s really simple to do. Choice is always a good thing in my books. I love having two ways to redeem my reward miles in my AIR MILES Cash balance. I can choose to redeem them in-store at participating in-store Reward Partners or online at airmiles.ca/cash. This new feature gives Collectors like me more flexibility in deciding how to redeeem rewards. With the AIR MILES eVouchers, you can use your reward miles to save money on your everyday purchases like movie tickets, apps, music, coffee, eye wear and lots more. Another neat thing is that you can also send the eVoucher to family or friends. If you’ve got a kid away at school or a relative in another province, you can easily send them a reward via email. It’s perfect for me with my family living in Ontario. It’s an inexpensive way to say “I’m thinking of you” or “Happy Birthday”. What do I need to redeem an eVoucher? If you want to redeem your AIR MILES reward miles for an eVoucher, the first thing you need to do is set a balance preference for your reward miles deposits. For instance, I have mine set for 100% AIR MILES Cash. You could set your preferences at whatever percentage you like between the Cash & Dream balances. When you redeem an eVoucher, your rewards miles will come from your Cash balance so you’ll want to make sure you set your preference accordingly. You’ll also need at least 95 reward miles in your AIR MILES Cash balance to redeem for an eVoucher. This amount will give you at least $10 at the participating Reward Partner. For example, say you have 960 reward miles in your AIR MILES Cash balance, you can redeem up to $100 in eVouchers. Note you can only redeem up to $750 in eVouchers per day, across all the eVoucher partners. Where can I use eVouchers? I know you’re probably wondering the answer to this burning question: where can I use my eVouchers! You can find a full list at airmiles.ca/cash and can search by province. I’d also like to mention that it doesn’t matter where you live. You can use an eVoucher at any Canadian location of the participating Reward Partners. I love the flexibility because I often go to Ontario and New Brunswick to visit family and can use my eVouchers there too. The eVoucher partners’ roster is growing and you can easily check online to see if they’ve added any new partners. I was excited to see many retailers where I frequent regularly! AIR MILES provided me with some extra reward miles in my Cash balance to redeem some eVouchers! Let me take you through the steps and show you how simple the process is. It takes mere minutes to do….no kidding! 1. Visit AIR MILES and login using your Collector number and PIN. You’ll be able to see how many reward miles you have in your account. Remember you must have at least 95 reward miles in your AIR MILES Cash balance to redeem for an eVoucher. 2. Click Redeem Miles and then AIR MILES Cash. Then you’ll click Participating Reward Partners for a list of all the retailers as well as see how many reward miles you’ll need. For example, you can get a $10 eVoucher for Starbucks when you redeem 95 reward miles. 3. Click Get eVoucher when you’ve decided on where to redeeem your reward miles. You’ll then fill out your email address and decide whether or not you want to send it to family or friends. Select Redeem Now and your AIR MILES are instantly deducted off your Cash balance. Watch your email for a confirmation of your redemption and another email with your eVoucher. How do I use my eVoucher? How to use your eVoucher to get cash off your purchase will depend on the Reward Partner you selected. Some will have you input a code to redeem while others will ask you to print off the eVoucher and bring it with you to the store. 1. 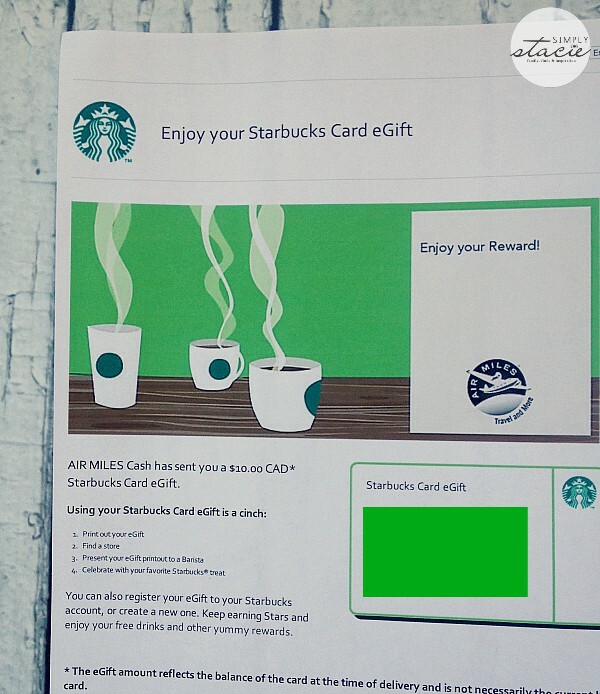 $10 Starbucks Card eGift for 95 reward miles. Print out your eVoucher and bring it with you to your local Starbucks. You can also add it to your Starbucks account online. 2. 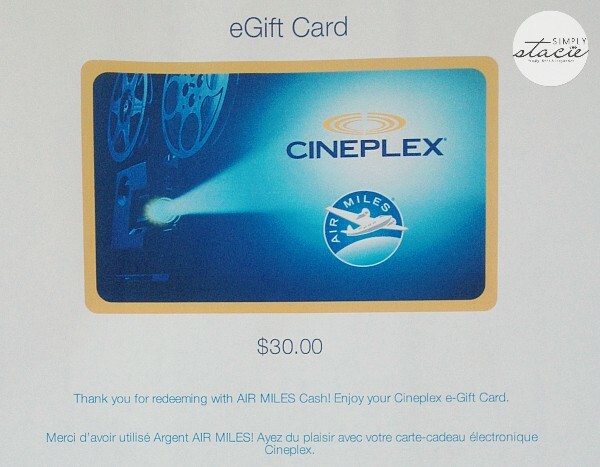 $30 Cineplex e-Gift Card for 285 reward miles. This particular one had a few options that ranged from a $10 eVoucher to $100 eVoucher. Use it online at the Cineplex site or bring it to your local Cineplex location. 3. $10 iTunes Code for 95 reward miles. Input the code into your iTunes Canada account on your computer or mobile device. I inputted mine on my iPhone and the credits were immediately added to my account. I ended buying two eVouchers since I download lots of apps for my daughter’s iPad and music for myself. 4. $10 Kernels Virtual Gift Card for 95 reward miles. Print the virtual gift card or display on your mobile device to show at any Canadian Kernels store. I’m saving this one for my sister’s birthday. She lives in Ottawa and has a Kernels location near her house. I also wanted to mention that some eVouchers are for one-time use. What this means is that any remaining funds on an eVoucher can’t be carried over to a future purchase. You’ll need to use the entire amount of the eVoucher when you visit the retailer. I love how easy and streamlined the process of redeeming for eVouchers is. It can all be done from the comfort of your home and it’s instantaneous. There’s no waiting for snail mail or lots of forms to fill out. The best part, though, is that I’m saving money and that is always a good thing! I would definately choose ciniplex! I would Love a Kernels reward!